I am no where near finished with reporting on Spring Quilt Market and I'm already having to book my trip for Fall Quilt Market. Oh, and did I mention Checker Distributor's Open House coming in late August? Let me just say that if I don't buckle down, I'll never ever ever get to the bottom of these photos. And today's photos....trust me.....you won't want to miss!!! Amy's school house was so full people were standing in the hallway trying to look over other people's heads to see what was happening. I was one of those with my zoom lens on my camera trying to get a tiny glimpse of what Amy and her incredible team had for all of us at Spring Quilt Market. Mallory is on the far left and she is a wonderful gal who works on Amy's team. Then you might notice the fella on his knees behind the slide show....that would be none other than David Butler, Amy's just as wonderful other half. I took so many photos but I'm not going to post them because all you can really see is how packed that room was. I just love this jacket Diane Capaci was wearing. When I see Amy Butler Designs I typically think of young people (I don't consider myself part of that group) and when I saw Diane (not that she is as old as me but surely she is not 20) wearing this jacket, I was surprised and excited by how nice it looked on her. I think it is time I break out of my old way of thinking....get a bit hipper (not hippier)! Did you know Amy Butler has thread now? Westminster/Rowan offers Amy Butler threads that are just as beautiful as her designs. Here Amy is hard at work on the market floor. She was hopping the entire time. I bet she must sleep well to be able to do all that she does. Did I say she? I did....I should have said they. Amy, like many other very successful people has a great team of people working with her. Remember this post? If you scroll down and read the entire post you'll she just how much of Amy Butler Designs is really Amy and David Butler Designs. David's website, Art of the Midwest, really says it all. He is one amazingly talented man as well. I think that Patrick Demsey of Grey's Anatomy Fame needs to move on over and sit on the bench next to Brad Pitt because David Butler is "movin on in"!! Check out what the IHAN secret photographers caught David doing while at Spring Market......Kissing Mrs. IHAN, can you believe it? I didn't think you would believe me....guess I deserved that...LOL! David's description of "Middle-American Art & Design-Creative Endeavors designed to elevate presence and give rise to the voice of excitement, honesty & reason." My defense is that I had a creative endeavor that eleveated my presence and gave rise to the voice of excitement without any honesty or reason. You know I searched high and low for a photo of the IHAN lunnie that was facing to the left but I could not find one. So I had to settle for this....too bad I have no idea how to doctor up photos to make them look real. IHAN blog readers know I always bring home treats to share and here they are.....an autographed Amy Butler Designs tote and the 2010 Spring Catalogs from Amy Butler Designs that includes a beautiful pattern of a Laminated Picnic Blanket with Carrying Case and Tumbler Roses Flannel Quilt Pattern (both autographed) AND a Pattern for the Betty Shopper!!! All you have to do to win this great collection is to leave a comment on this post telling me you can't blame me one bit for doctoring the photo AND which Amy Butler Designs product line you like the best. Comments will close next Wed night. These are some of the other UFO's I worked on while in PA. 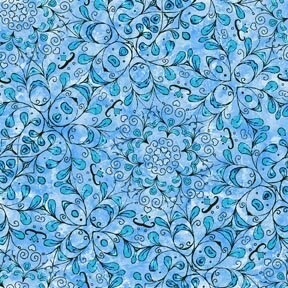 I won this pattern and a Jelly Roll from Green Fairy Quilts last year. This is what the the quilt top looks like now. It is not finished yet but my goal is to finish it and ship it to Judi and Clint for their Romania Trip (Green Fairy Charity). Clint will be going to Romania again this year to take quilts to homeless children and those who live in orphanages. They are still collecting donations for their trip as well. Click here for more information. Did you know that 100% of the funds go directly to the children in Romania? They pay for their own travel expenses so that every penny they raise goes to those in need. I applaud Judi and Clint and look forward to sending this quilt for them to take along. The Snap Backpack pattern by Lacy Hill of Golden Thyme Designs. I am embarrassed to say that I started this backpack last November while in PA for Thanksgiving. This is the front of the backpack. As you might be able to see, I had done a chalk drawing of a Celtic knot and I had intended to applique it to the back of the backpack. I decided it needed something much more "wonderful." But exactly what that wonderful is I don't know. Do you have any ideas? I'd sure like to hear your thoughts. I now know why Lacey used colorful fabrics for her backpack. I love batiks and I really like how my bag turned out....but it is too plain. Here are the pockets inside. I love all the pockets the pattern calls for. I will have a place for everything! This is a photo of the back and the straps. I just love the bag, I just need some ideas for embellishing the back. Last night I finished hand stitching around all of the bended bias for my table runner (Linda Poole's class). So I'm making progress and I'm enjoying all the hand stitching. I think that is my favorite. On a personal note, I'm finding it very difficult to re-acclimate back into my routine here in OH. All I can think of most days is what my friends are doing in PA. Anyone have an extra 450,000 to buy the farm across from MJ's house? I'll send you the proper spelling of my name so you can have it put on the deed correctly. I'd even send a thank you card....LOL. 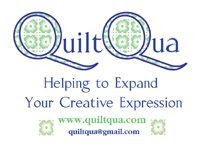 Last Monday night was the Mountain Laurel Quilt Guild Meeting in Wellsboro, PA. I had learned just before I left that Linda Poole was going to be their speaker. Back in March, Linda Poole had come to The Gathering of Quilters here in OH. I loved her presentation and was so thrilled when I got to take her Bended Bias Class held at the Sonflower Quilt Store in Sylvania, OH. I loved the class and promised not to let my table runner become a UFO. When I got to the Guild Meeting last Monday night I was so excited I could not stop telling my girlfriends how much they were going to enjoy the program. I snuck up on Linda and surprised her. I was glad she remembered me. Of course she was surprised to see me there and I told her I was "stalking" her....LOL. Here Linda is peaking out from behind her beautiful fairy quilt. I was so busy enjoying her lecture I did not take any pictures of her speaking so I posted this one below. This is the table runner I started when I took her class back in March. Below are some of her absolutely gorgeous quilts she shared with us. Many of these are from her book, Turkish Delights, that is no longer available except through Linda's website. Bended Bias Applique is also a great book Linda has written. 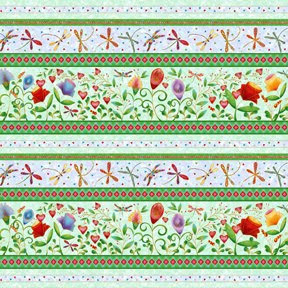 Linda shares the influences that all of her travels have had on her quilting. You will never look at your travel experiences the same after you hear Linda's excellent lecture. This quilt is from Linda's book, Quilted Fairie Tales. Not only is Linda a Quilt Designer, she is also a a gifted Writer as well. Every fairy in her book has it's own poem. Below is a photo of my table topper still in progress. I really enjoyed Linda's class and think she is an top notch instructor. Don't miss taking her classes if you get the chance....you will be thrilled you did. 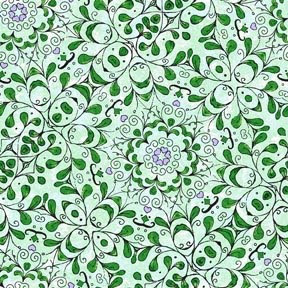 Oh, did I mention Linda also designs fabrics? Some people are just so talented!! Check out her Iridescence line with Avlyn Fabrics. "Whimsical, beautiful and full of movement with a little bit of sparkle. Iridescence by renowned quilter and artist Linda M. Poole features swirling dragonflies, colorful garden flowers with outlines of metallic gold and an intricate yet delicate medallion pattern." from Avlyn's website. I can't wait to see what Linda does next. To be so talented is such a gift. I could not resist putting on a Vintage Feed Sack Dress the first day of my vacation just after I woke up. I had not even combed my hair or brushed my teeth. Quit laughing and run to the bathroom before you wet your pants!!! Remember these little "turkeys?" The ones that wanted to hop out of the coop? A wild turkey and her two two little babies came up today to check out the chickens. They looked at each other through the fence. It was so cute. Check out these vintage feed sacks my girlfriend has. Aren't these amazing. 35 of them in all.....I could not believe my eyes. She is going to sell them so if you know anyone who collects vintage feed sacks or is making a 1930's quilt have them e-mail me (IHaveANotion@yahoo.com) and I'll pass along the information. They have all been washed and pressed (they smell fresh not vintage!). All of the feed sacks are going to be sold as a collection and not broken up. The photos below are just pictures that I took of them as she was showing them to me. 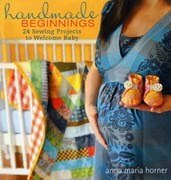 Hand Made Beginnings by Anna Marie Horner. This is my friend Anne's new chicken coop. She has just started raising chickens. Much to my surprise when I saw them....they were not all white. When I think of chickens I think of white birds not the variety that they come in....see I'm a city girl...lol. Anne is in front and Mary Jane is behind wearing yellow. We were watching the little chickens run around and do their little chicken things....like peck at dirt and such. It was getting late and it was time for them to go to bed so Anne said I could help her put them in their coop. Surprisingly enough I was afraid of those little things....they ran like a dickens to get away from me. Success....finally I had caught one. By the second night I had it down....I would chase them into a corner and then one by one pick them up and put them into the coop. They needed some water so I took the bowel into the house and filled it up and brought it back out to the coop. Once I opened the gate one jumped out and started running. I set the bowl of water down and chased the little run away and put it back in the coop. By that time they others had spilled the water I had just filled. So back into the house for more water....after the second trip and running the water twice....it was time for me to use the bathroom.....then back out to the chicken coop. All I could think of was the book about giving the mouse a cookie....it will always be something else....so funny. We waited for two nights to see the momma bear come with her four cubs but I was not able to see them. Hopefully before I go I'll be able to see them come over the mountain. I'm keeping my fingers crossed. These are some of my PA friends, Kay, Me, Mary Jane and Bev. We had dinner together before the Guild meeting on Monday night. Oh I have to share about Monday night....what an incredible night. I'll do that soon I promise. Our Tuesday group got together to stitch. From left to right: Phyllis, Kay and Leona. Left to right: Carol, Bev, Mary and Marge. Several gals were not able to be there on Tuesday and I sure did miss them. These are the lovely ladies I spent 11 months with when I lived in this area. I don't get much chance to visit with them and I decided it was time for some "me" time. I'm having a wonderful time and my spirit is full and I have had many peak moments while here. I'll post more soon....wait until you see the feed sacks and me in the feedsack dress....now that is worth waiting for....what a hoot. UFO Completed....Can I get a YAHOO! !